(Español) Grupos parlamentarios por los derechos de los trabajadores del textil. A woman is weaving between red fabrics in Plaza Callao in Madrid. At his feet, dummies lying on the floor. It is a human sculpture that represents the precariousness of the working conditions of the textile industry. 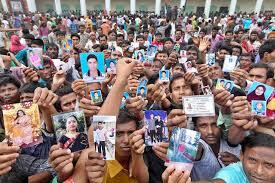 The production chain of the textile industry leaves a trail of victims of exploitation in every stage of the manufacturing process: from the harvest of cotton in the hands of children in Uzbekistan, to the toxic dyeing of fabric in Bangladesh and the manufacturing of clothing under slavery conditions in Brazil. suppliers and current legislation sometimes excludes them from liability. 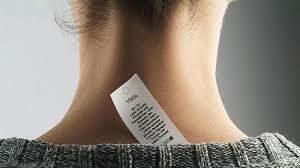 In April 2017, the European Parliament approved a report calling upon the European Commission to implement new, mandatory legislation ensuring that textile multinationals are responsible for all human rights violations in the manufacturing chain, and also in their subsidiaries and suppliers. 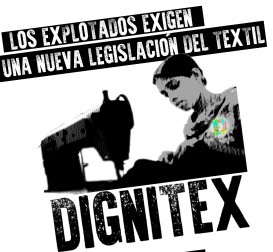 In solidarity with the victims of exploitation in the textile industry and in support of their fights, we believe this is a historical landmark to take steps towards a world where every worker´s rights are respected. 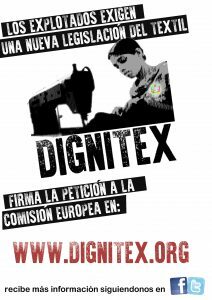 It is for this reason that we demand of the European Commission and our political representatives that they effectively implement the European Parliament´s petition and that a new binding legislation guaranteeing human rights in the textile industry´s production chain is introduced as soon as possible.